It was not straight line growth. It was stair step growth. Back in my math geek days, we called this a step function. 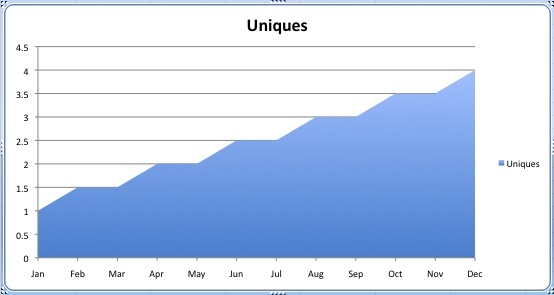 And this is what the user growth charts of most of our portfolio companies look like. Nick Denton published a manifesto on blog design and blogging earlier this week. In it he showed this growth chart. You'll note a similar stair step function in this chart. Growth comes in steps. There's a big event. Shaq joins Twitter and brings his fans with him. There's a spike. Things calm down, but they don't go down. Then a plane lands in the hudson. Another spike. Things calm down, but they don't go down. That's how it was with Twitter and that's how it has been for most of our portfolio companies. 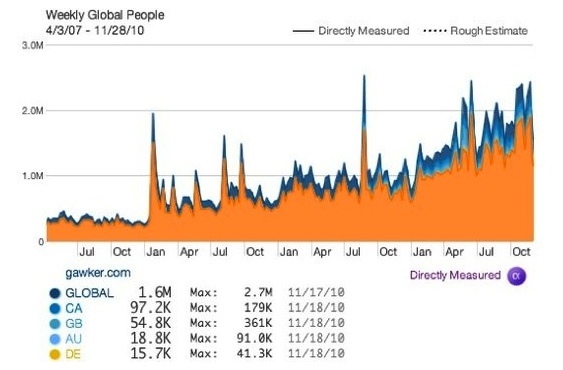 The big events drive user growth. For Etsy it might be a seller being featured on Martha Stewart's TV show. For Tumblr, it might be Newsweek starting a tumblog. For Disqus, it might be Techcrunch joining the network. For Nick Denton, it is clearly "aggressive news-mongering." The key learning is that, as Nick says, "the audience settled down, but at a higher level." Big events will drive audiences and some of them will stay. And you will grow in steps.